Turn something ugly into a piece of art with one of our waste receptacles. Your trash can become someone else's treasure and we have provided a way to do just that. 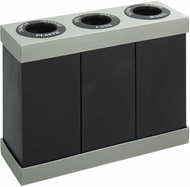 Step into the future with trash bins that are uniquely designed in a variety of colors, shapes, styles, sizes and composition. It is all about the look with us when it comes to putting away your waste.